This sticker in black and white depicts a crowd of women with their mouths open as if they were shouting in unison. The text in purple, a color used to represent women's rights issues, is raising awareness about inequality and gender violence. The sticker comes from an organization called United Left, a political and social movement with the goal of transforming the capitalist system into a democratic socialist system. 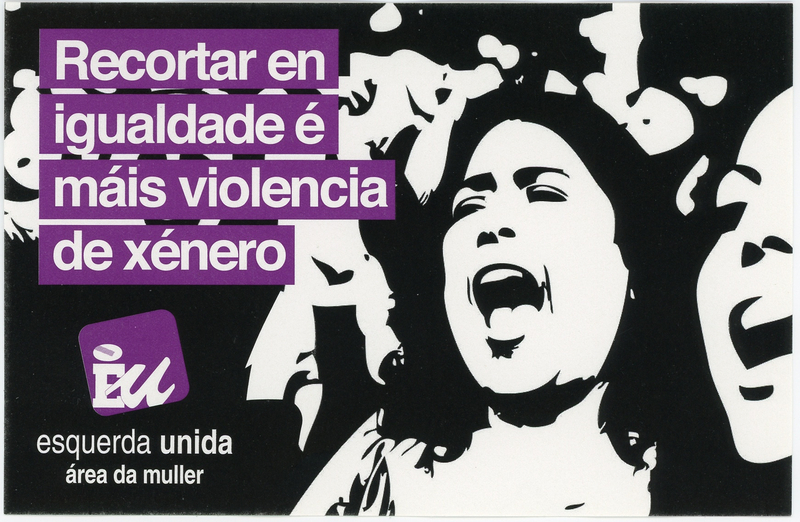 This particular sticker comes from the area of the organization centered on women's rights. Emphasizing justice, equality, solidarity, and respect for nature, it makes sense that United Left would be standing up for the issues represented in this sticker. The text is also written in Galician, which speaks to the fact that the influence of United Left spans all over Spain.